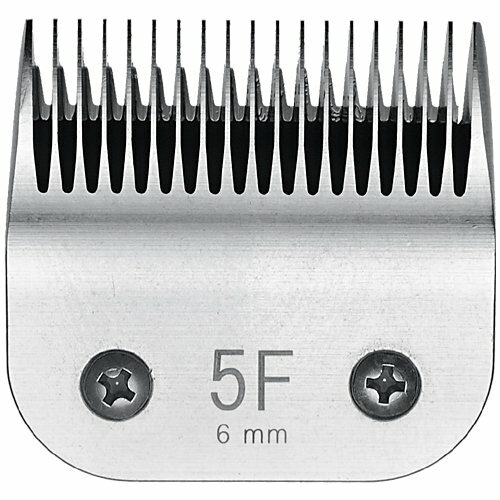 Miaco clipper blade size 5F. Cuts 1/4"/6.3mm. Replaces Oster clipper blade 919-17. Clipper blade size 2. Cuts 1/4"/6.3mm. Replaces Oster 918-12. Durable HRC60 High carbon steel. A short, smooth finish can be achieved with this blade. It is effective for finishing the coat after trimming with a size 5 skip tooth blade. This blade can leave a nice finish on most sporting breeds as well as long-legged Terriers. It is most often used for finishing a short lamb trim. Fits all clippers that use A5 style detachable blades such as Oster A5, Golden A5, Turbo A5, Oster Power Pro, Andis AGC, Andis AGR, Wahl, Laube, Moser, Thrive, etc. Clipper blade size 5F. Cuts 1/4"/6.3mm. Durable HRC60 High carbon steel. Fits Oster, Wahl, Andis other detachable blade clippers. Fits Andis AGC, BGC, Oster Classic 76, A5, Wahl KM1, KM2, etc. If you have any questions about this product by Miaco, contact us by completing and submitting the form below. If you are looking for a specif part number, please include it with your message.